Wynton Learson Marsalis is an American trumpeter, composer, teacher, and artistic director of Jazz at Lincoln Center. He has promoted classical and jazz music often to young audiences. Marsalis has been awarded nine Grammy Awards, and his Blood on the Fields was the first jazz composition to win the Pulitzer Prize for Music. He is the son of jazz musician Ellis Marsalis Jr. (pianist), grandson of Ellis Marsalis Sr., and brother of Branford (saxophonist), Delfeayo (trombonist), and Jason (drummer). Marsalis is the only musician to win a Grammy Award in jazz and classical during the same year. Joe Mazzaferro – Is a trumpeter, educator, composer, and arranger who has been active in the Sacramento, Stockton, and Central Valley jazz scenes since 2002. His formal studies include a Bachelor’s of Music in Music Education from the University of the Pacific and a Master’s of Music in Jazz and Studio Music from the University of Tennessee. With numerous credits ti his acclaim, currently he is the Coordinator of Jazz Studies at California State University Stanislaus where he teaches various jazz courses and directs the CSU Stanislaus Jazz Ensemble. 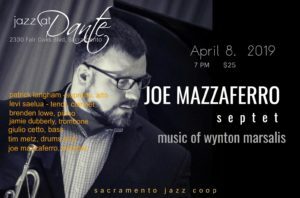 The Sacramento Jazz Coop proudly presents the Joe Mazzaferro Septet with the music of Wynton Marsalis featuring Joe Mazzaferro on trumpet, Patrick Langham on soprano and alto, Levi Saelua on tenor and clarinet, Jamie Dubberly on trombone, Brenden Lowe on piano, Giulio Cetto on bass, and Tim Metz on drums.